Never has a weekend embodied my blog as much as June 23-24. In less than 48 hours, culture, society and life was represented, and experienced, in significant ways. One is usually never as patriotic as when living abroad. Since my husband and I moved to the Us, we have turned minor Swedish celebrations into social gatherings in a ways we never did when living in Sweden. Prime example of that would be the new found importance of Fettisdagen (Fat Tuesday) and it's semlor (http://en.wikipedia.org/wiki/Semla). So, what happens when one of the most important holidays to all Swedes, regardless of where they live, comes knocking on your door? You pull out all the stocks, invite your friends and immerse yourself in all things Swedish. Hello, Midsummer! 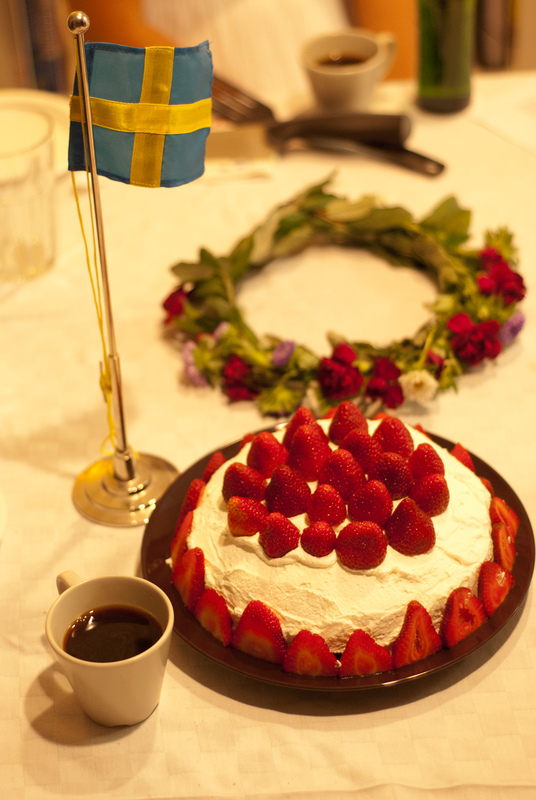 What kind of Swedes would we be if we didn't celebrate midsummer? And as cultural ambassadors, it's not enough to just stop by IKEA and pick up whatever they have to offer. In all honesty, I will credit most of the midsummer feast to IKEA, but this year, I cured my own salmon, made my own meatballs and baked my own strawberry cake which required a homemade vanilla custard. We also made flower wreaths to wear in our hair, which I haven't done since I was a young girl, and back then it was mostly me watching my mom make me one. 14 years ago, in 1998, I did my first public debate, defending gay rights. That specific time it was regarding equal rights to be eligible to adopt, regardless of sexual orientation. The battle of people's equality in the eyes of the law, and ultimately society, has always been a passion of mine. I'm happy to say that Sweden has come far in this battle, so perhaps it is just fitting that I have made the US my new battle ground. One of my favorite things about San Francisco, if not the favorite thing, is that the city welcomes everyone. There is room for all to express themselves in which ever way they want. I have stood in the audience, cheering, at San Francisco Pride Parade before, but this year I had the chance to participate in a more significant way, I had the chance to march in the Pride Parade. Joining the hundreds of Google employees with friends and family, we danced our way down Market Street. I can't help but to get a little teary eyed when I think back at all the smiles, cheers and the celebration of love. Cause at the end of the day, that's what it's all about. 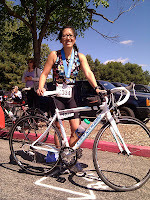 I finished my first triathlon! 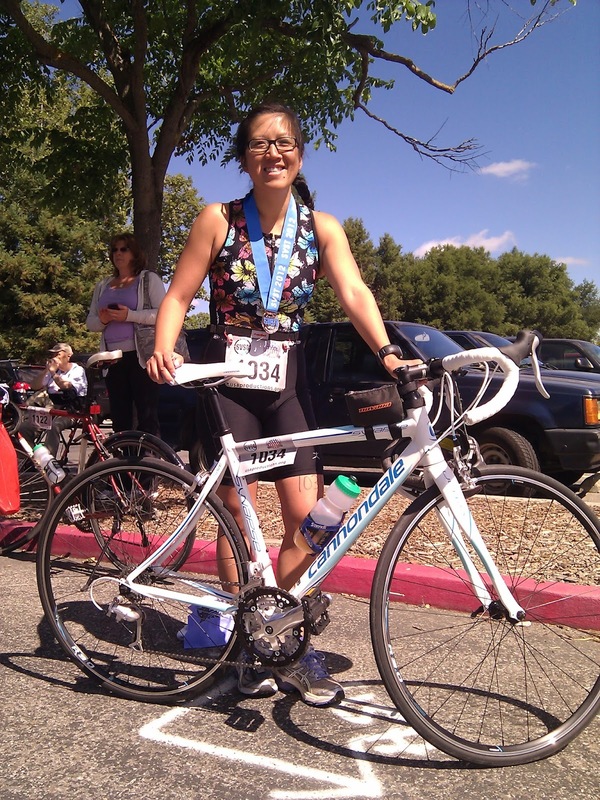 Jennifer vs. Silicon Valley Sprint Triathlon, 1-0! Two years ago, I went out on my first attempt to run. I had to stop and rest after 200 meters (0.12 miles). Last weekend, I swam 800 meters (0.5 miles), biked 30 kilometers (18.5 miles) and ran 5 kilometers (3.1 miles). And the best thing of all, I was six minutes faster than the average female! It might not sound particularly impressive, but trust me, there were some pretty serious athletes in the race. Ok, so I'm a TERRIBLE swimmer! Awful! The distance was not a problem, I was just very, very slow. Also, I learnt pretty fast that swimming along side other people in a lake is very different from swimming by yourself in a pool. I swallowed quite the amount of water and I found the whole experience pretty taxing. Biking was better. I turned out to be just below an average biker, which I feel fine about, considering I've biked for less than two months, and I bike in my running shoes. However, I need to increase my lactate acid threshold. When my legs gave in, I was biking on pure willpower. Unfortunately, willpower will not make you go as fast as properly trained legs. The hills were no joke! I'm an ok runner and I expected to run faster than average, which I just barely did. Coming off a bike after 75 minutes of peddling, in wet socks, I had lost all feeling in my toes. But I figured, if I just keep placing one foot infront of the other, my legs will know what to do. And the funny thing is, the fastest mile I've ever run, in a race or practice, was the first mile coming off my bike. But then my stomach and legs started to cramp so I had to slow down significantly. But it made me wonder, what capacity I actually have, if I just push myself harder. My transitions were surprising. Apparently, they were my strong suit. They were not perfect, by any means, but I was fast enough for it to make a significant impact on my overall time. All in all, I'm very proud to have completed my first triathlon. I was hoping to enjoy it more, but at least it was interesting enough and I know I will do it again. I need to learn how to properly swim. I need to build biking legs and start using bike shoes with cleats. There is so much room for improvement, I'm curious to find out how much I can advance. Who am I? A very profound question, indeed. I've been on this earth for about 30 years and thought I had figured myself out pretty well by now. But recently I've had my pre-conceived ideas about myself not only stirred, but shaken. If you know me or have followed my blog over the years, it should come as no surprise when I tell you that I truly enjoy shopping (especially shoes), food and entertainment (an example, The Eurovision Song Contest). Last year, I consciously added a new aspect to my life, healthy living. I started exercising regularly and I finally found a way to successfully manage my weight. As a part of my healthy living, I picked up running. I can't say enjoy it, but there is no denying, it is a very efficient way to build stamina as well as burn calories. To sum it up, I'm an almost 30 year old who likes to shop, eat, be entertained, with a healthy BMI who exercise regularly. I don't just like shopping, I love bargain shopping. So, hitting the outlet mall on Memorial Day was a no-brainer. After a good few hours of scavenging, I had found some amazing deals. I bought a new pair of running shoes, padded bike shorts, a reflective bike jacket, bike gloves and two workout tops. I also found a pair of sandals I really liked, but decided that $40 was too much to spend. How many pairs of shoes does one person really need? However, when I got home later the same day, I signed up for a 10K race for $45 without blinking. Did I choose racing before shoes? We live in a small city. But in our small city, there is a restaurant rated in the Michelin Guide. The restaurant, Chez TJ, has a star of it's own, but amongst the chefs who started their careers at Chez TJ, the alumni currently hold eight stars in the Michelin Guide. Ever since my husband and I moved here, we have debated whether we should go or not. Food is a great love of mine, perhaps my greatest love. But more than anything I love simple street-food so spending a minimum of $85 per person on one meal has never seemed reasonable, so we have never been. Over the past month, my husband and I have planned out our running goals for the near future. We're attempting our first triathlon in a few weeks, he's running SF Marathon later this summer, I'm running San Jose Half Marathon later this fall and next spring we're running Gothenburg Half Marathon. We made sure to register for all the events, so that we can't back out. All in all, we spent over $600 on registrations fees in May. For the same amount of money we could have gone to Chez TJ and treated five of our friends, or the two of us could have splurged on the Chef's Tasting Menue, with wine pairing and still have $200 so spare. Did I just choose racing before food? I've been ignoring the signs, maybe because I didn't want to realize I was changing. But there was an incident that opened my eyes and force me to face the truth. I'm a huge fan of the Eurovision Song Contest. If you don't believe me, you should read my previous blog posts. Sweden won this year's competition and as a reward, Sweden will host the event next year. The Eurovision Song Contest is always held in May and I'm planning to be in Sweden in May 2013, to run Gothenburg Half Marathon. But as it turns out, the Grand Finale of Eurovision Song Contest 2013, will be on the same day as the half marathon, most likely in a different city. If Sweden is lucky, we'll be able to host Eurovision Song Contest once a decade. Gothenburg Half Marathon is every year. However, I've worked really hard on my fitness and I'm hoping to be in the best shape of my life next summer. I'm making it sound like a difficult decision, but in fact, I had already made up my mind. Gothenburg Half Marathon, I'll be seeing you in May 2013! Did I choose racing before the Eurovision Song Contest? Yes, I did! So, when looking at the facts, am I actually not an almost 30 year old who likes to shop, eat and be entertained as much as I am an almost 30 year old, who likes to run races, cook healthy food, shop workout gear and occasionally be entertained.